w i n t e r 2 0 1 4 | W e s t W o r l d A l b e r t A 5 I 'm sure by now you're wondering why we've turned this issue on its side and replaced our traditional magazine cover and its beautiful travel photo with an image of our AMA member- ship card. Well, it's our way of grabbing your attention so that we can remind you of all the great benefits you have access to as a member of our organization. By turning the magazine on its side, I'm hoping you'll not only flip through the pages and look at this issue differently, but also look at the value of your membership a little differently, too. I sometimes hear from members that when they think of us, they primarily think of a com- pany that provides tows and emergency roadside assistance. at's understandable, since our road- side assistance vehicles are such a visible reminder about the value of an AMA membership. But the truth is, your membership is working harder for you than you may even know, in places far beyond the side of the road. It's important for me to make sure you're getting all the value you can from it. After all, you're paying us to have your back and one way we're doing that is by saving you money. From inspiring you to explore the world and protecting you when you do, to rewarding you just for being a part of our family, an AMA member- ship is unlike any other membership, anywhere. I had a long-time member contact me recently to say that while she retired the keys to her car last summer, she's decided to keep her membership because she's saving hundreds of dollars more than she pays to be a member. With the purchase of her new hearing aids and five years of free batteries, for example, she saved about $750 – or almost a decade of membership dues. I love to hear from members who are taking full advantage of their membership. I want to make sure you're getting that kind of value, too. 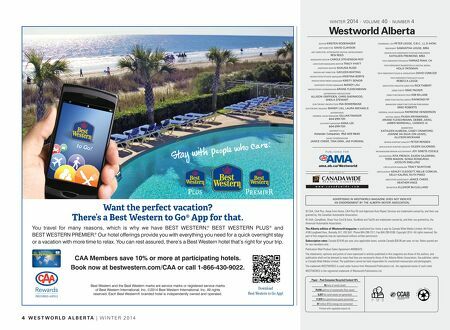 at's why, from now on, we'll be dedicating a few pages in each issue of the magazine to tell the story of our rewards partners and highlight the discounts and benefits they've designed just for AMA members. ere are a lot of stories to tell and I'm committed to sharing as many of them as we can over time. While AMA is always here if you need help at the side of the road, I want you to know we're working hard to protect you in so many other ways. Thanks for reading, and for being a part of our family. 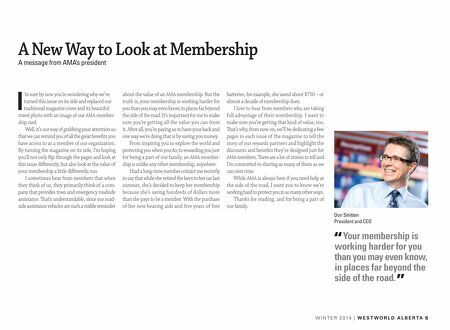 A New Way to Look at Membership A message from AMA's president Don Smitten President and CEO Your membership is working harder for you than you may even know, in places far beyond the side of the road. " "